Marouda’s Models | Azazel's Bitz Box. Azazel: Another Guest Post from Marouda. Hopefully we can keep her interested in painting models and these can be a more regular thing! 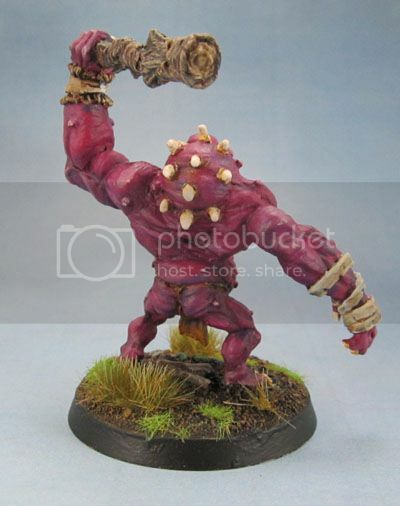 I painted this model about 4 years ago. 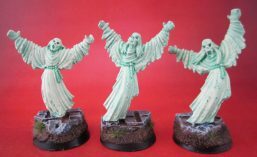 This figure is a very nice model sculpted by Julie Guthrie as part of the ‘All Things Dark and Dangerous‘ range for Ral Partha, probably in the late ’80s. 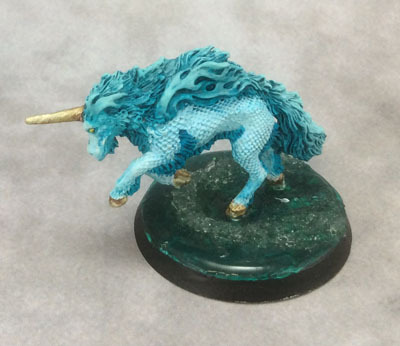 The model is a Kirin which is a creature that looks similar to a unicorn with the scales of a dragon. I remember that I enjoyed painting it as I particularly like mythological creatures such as unicorns and pegasi. 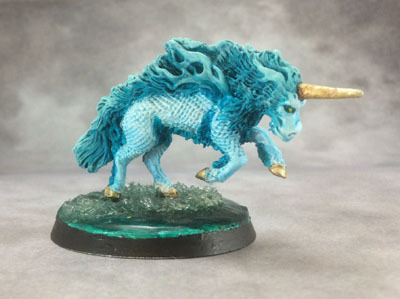 I chose to paint the Kirin in a turquoise palette of colours. The model was fairly easy to paint except for the fine detail of the eyes which require a very steady hand so I asked Azazel if he could help by painting the eyes. To provide a shimmer effect to the scales I used a white opalescent paint over the turquoise paint. I am really happy with how the mane and hair turned out. Azazel helped me with painting the base for the model. I wanted the Kirin to be running through waves. To make the waves of the water on the base ‘water effects’ was used. Azazel: Today’s post comes from Marouda, who I’ve convinced to start up her own WordPress account so that she can add the odd post to the blog. Her last contribution was adding her thoughts and perspective to the review of Dungeon! back in Jan 2013. 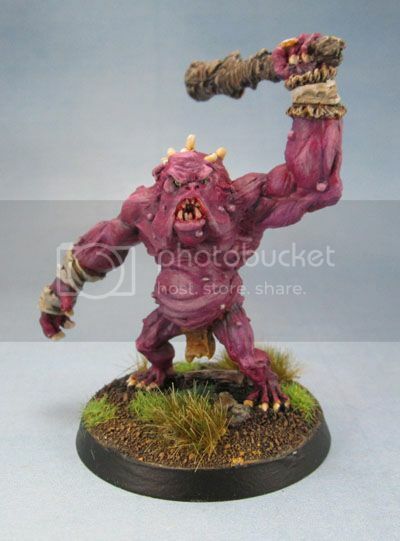 This model is Reaper’s Thornback Troll by Ben Siens, Released in 2004. I selected this model to paint for a Reaper Miniatures painting competition in 2011. However I never got him finished in time, so he sat unfinished for a while. Originally he had a bright orange yellow loin cloth, which Azazel suggested that I tone down. The shading and highlighting on the muscles took ages to do as it involved many, many layers. I enjoyed painting his club and his pimples. 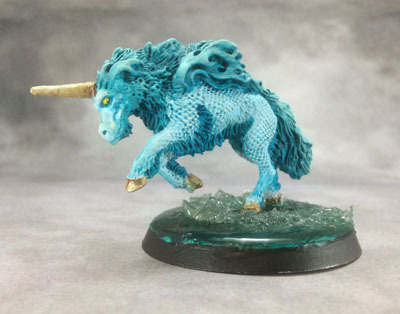 I am very much a beginner painter, but it’s very handy having Azazel who has been painting for most of his life coaching me through the various stages and layers of painting. Last week I decided to finish the model and further highlighted his belly brows, jowls and muscles with a pale highlight. I did all the painting on this model myself apart from the very fine detail work of the pupils of the eyes, some of the teeth and the base. This is the second model that I have ever started and just recently finished apart from some Teenage Mutant Ninja Turtles that I painted more than 10 years ago. 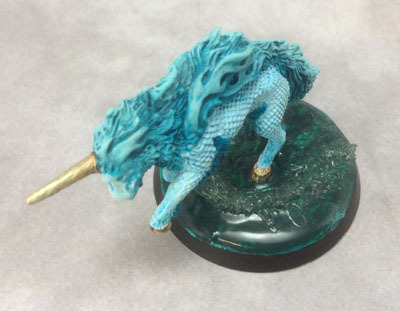 I also started and finished a water unicorn model at the same time I started this troll. I have a female Entwife figure from Mithril Miniatures that was started some years back that I should really get finished. I also really like the GW Tomb Kings models although that involves some very fine work and a very steady hand. Azazel: I did the basing so that the model remains consistent with the rest of the miniatures. The model was based on a round back when this model was started, and since it’s as much a display model of Marouda’s as a gaming piece, I’ll leave it on the round instead of rebasing to square as the other trolls are. 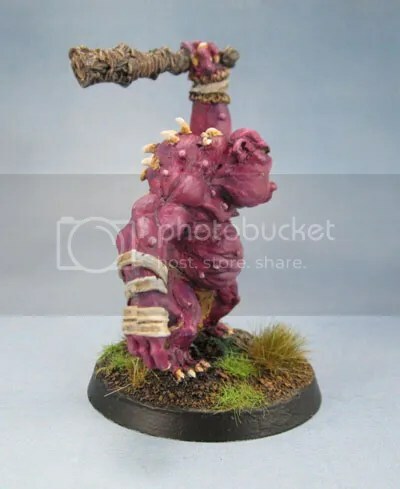 Tufts of course tie the model in with the other trolls in the collection, so this purple guy can fit in nicely enough in a unit with the various others.